<h2>Digital innovation can enhance cultural heritage, hears conference</h2><br /><p>The Innovation and Cultural Heritage conference, held in Brussels on 20 March 2018, brought together a diverse range of researchers from the fields of science, technology, archaeology, social sciences and humanities, where they showcased their interdisciplinary work in this arena.</p> <p>Speaking at the conference, Mariya Gabriel, EU Commissioner for Digital Economy and Society, said: 'Europe is blessed with an immense cultural heritage which can provide us with a sense of a shared identity and inspire us,' adding that, 'digital transformation may play an essential role in protecting this heritage'.</p> <p>However, experts also sounded a note of caution, warning that digitalisation should not replace real-life experiences.</p> <p>Carlos Moedas, EU Commissioner for Research, Science and Innovation, spoke about the importance of cultural heritage for urban regeneration and the need to innovate for the future by learning from the past, but added: 'You cannot digitise experiences. You can digitise the artefacts, the paintings, but you cannot digitise humanity. '</p> <p> <div class="quote-view quotesBlock quote_horizontal"> <div class="quotesTop"><img src="https://horizon-magazine.eu/sites/all/themes/horizon/images/quotes_top.png" alt="" title="" /></div> <p>'If Europe doesn’t build a positive cultural identity, others will. '</p> <blockquote><p>Prof. Gábor Sonkoly, Eötvös Loránd University of Budapest, Hungary</p></blockquote> <div class="quotesBottom"><img src="https://horizon-magazine.eu/sites/all/themes/horizon/images/quotes_bottom.png" alt="" title="" /></div> </div> </p> <p>Professor Gábor Sonkoly of the Eötvös Loránd University in Budapest, Hungary, encouraged attendees to 'engage in a physical context with our heritage.' He urged researchers to handle digital technology critically, as he said it could lead to extreme individualisation, the 'opposite of community-building'.</p> <p><strong>Digital curators</strong></p> <p>Professor Sofia Pescarin, a researcher at the Italian National Council of Researches (CNR), in the Institute of Technologies Applied to Cultural Heritage in Rome, said that museums need to attract more visitors without losing credibility, and that there are a lot of ways to ensure that digitalisation doesn't lead to excessive individualisation. She pointed to the EU-funded GIFT project, which is developing digital experiences where people engage physically with each other to share playlists of their favourite museum exhibits. GIFT is also enabling visitors to enjoy technologies that measure emotional responses to artwork, and share their experiences with other users. She spoke about how virtual reality can be developed to enhance museum exhibitions and add a more interactive storytelling element. 'There is a need for digital curators within our museums,' she said.</p> <p>Professor Pier Luigi Sacco of the International University of Languages and Media in Milan, Italy, and special advisor to the European Commission, gave a second example, the 'Father and Son' game developed by the National Archaeological Museum in Naples. Highly rated, this popular game is available as an app for Android and iPhone devices, and tells the story of a son who follows in the footsteps of his archaeologist father, whom he has never met. Going through several stages, to unlock the final level of the game, you must visit the museum.</p> <p><strong>Digital conservation</strong></p> <p>Digital technology is not just a new tool to visualise, explore or consume cultural heritage – it can also assist with conservation efforts.</p> <p>Professor Antonia Moropoulou of the National Technical University of Athens, Greece, spoke in detail about the restoration of the Holy Aedicule in the Church of the Holy Sepulchre in Jerusalem, Israel. She worked with digital specialists to develop a high-resolution 3D model of the Holy Aedicule, which allowed her team to devise the optimal way to restore it. The model allowed them to identify damage that had been done by previous conservation efforts, and to assess how the monument might react to seismic activity in the area, and plan its rehabilitation accordingly.</p> <p>Innovation and digitalisation are not synonymous, however. Other new initiatives in cultural heritage preservation and promotion included using neutron beams to identify biological remains within fossils, nanotechnology in gels to restore paintings, and leveraging cultural heritage as a catalyst for urban regeneration.</p> <p><strong>European identity </strong></p> <p>The theme of cultural heritage as an antidote to the rising tide of extremist and populist anti-European political movements arose several times throughout the conference. Professor Efrem Yildiz of the University of Salamanca, Spain, said that a good investment in cultural heritage could be used to ‘discover a fundamental way to counterbalance this growing and terrifying narrative.' Christian Ehler, member of the European Parliament, warned about how populist parties can use cultural heritage to manipulate the public, while Prof. Sonkoly said, 'If Europe doesn’t build a positive cultural identity, others will. '</p> <p>The European Heritage Label and the <a href="https://ec.europa.eu/programmes/creative-europe/actions/capitals-culture_en" target="_blank" rel="noopener noreferrer">European Capital of Culture</a> were highlighted as initiatives that not only supported cultural heritage, but also brought the idea of a shared European identity to the citizen.</p> <p>The EU Commissioner for Education, Culture, Youth and Sport, Tibor Navracsis, said that Europe needs to actively innovate with cultural heritage to engage communities. 'We have to use cultural heritage as a source of energy for future projects, for innovation. These times, when the very future of the community at European level has been put into question, and there are diverging views about the future prospects of the EU, we have to take cultural heritage out of the museums, put them back into everyday life and investigate how we can use the experiences and achievements of past generations. '</p> <p> <div class="moreInfoBlock"> <h3>European Heritage Labels</h3> <p><a href="https://ec.europa.eu/programmes/creative-europe/actions/heritage-label_en">European Heritage Labels</a> are awarded to sites of important significance to European history, with a focus on promotion and facilitating access to cultural sites. They have a symbolic value – they have played an important role in European history and the activities that they offer bring the European Union and its citizens closer together. The initiative differs from the UNESCO World Heritage List because of the focus on the European narrative.</p> <p>Cities throughout the EU compete annually for the prestigious annual title of European Capital of Culture. Two cities are awarded each year, and the winners engage in a year-long cultural programme of activities.</p> </div> </p> <p><em>Editor's note: This article was updated on 22/3/2018 to clarify the affiliation of researcher Sofia Pescarin.</em></p> <p><em>If you liked this article, please consider sharing it on social media.</em></p> <p><a href="http://bit.ly/newsalertsignup" target="_blank" rel="noopener noreferrer"><em><img src="https://horizon-magazine.eu/sites/default/files/news-alert-final.jpg" alt="" width="983" height="222" /></em></a></p> <br /> <img src=”http://www.google-analytics.com/collect?v=1&tid=UA-40077089-1&cid=digital-innovation-can-enhance-cultural-heritage-hears-conference&t=event&ec=republish&ea=read&el=digital-innovation-can-enhance-cultural-heritage-hears-conference&cs=republish&cm=republish&cn=republish&cm1=1" /> This post <a href="https://horizon-magazine.eu/article/digital-innovation-can-enhance-cultural-heritage-hears-conference.html">Digital innovation can enhance cultural heritage, hears conference</a> was originally published on <a href="https://horizon-magazine.eu/">Horizon: the EU Research &amp; Innovation magazine | European Commission</a>. The Innovation and Cultural Heritage conference, held in Brussels on 20 March 2018, brought together a diverse range of researchers from the fields of science, technology, archaeology, social sciences and humanities, where they showcased their interdisciplinary work in this arena. Speaking at the conference, Mariya Gabriel, EU Commissioner for Digital Economy and Society, said: 'Europe is blessed with an immense cultural heritage which can provide us with a sense of a shared identity and inspire us,' adding that, 'digital transformation may play an essential role in protecting this heritage'. However, experts also sounded a note of caution, warning that digitalisation should not replace real-life experiences. Professor Gábor Sonkoly of the Eötvös Loránd University in Budapest, Hungary, encouraged attendees to 'engage in a physical context with our heritage.' He urged researchers to handle digital technology critically, as he said it could lead to extreme individualisation, the 'opposite of community-building'. Professor Sofia Pescarin, a researcher at the Italian National Council of Researches (CNR), in the Institute of Technologies Applied to Cultural Heritage in Rome, said that museums need to attract more visitors without losing credibility, and that there are a lot of ways to ensure that digitalisation doesn't lead to excessive individualisation. She pointed to the EU-funded GIFT project, which is developing digital experiences where people engage physically with each other to share playlists of their favourite museum exhibits. GIFT is also enabling visitors to enjoy technologies that measure emotional responses to artwork, and share their experiences with other users. She spoke about how virtual reality can be developed to enhance museum exhibitions and add a more interactive storytelling element. 'There is a need for digital curators within our museums,' she said. Professor Pier Luigi Sacco of the International University of Languages and Media in Milan, Italy, and special advisor to the European Commission, gave a second example, the 'Father and Son' game developed by the National Archaeological Museum in Naples. Highly rated, this popular game is available as an app for Android and iPhone devices, and tells the story of a son who follows in the footsteps of his archaeologist father, whom he has never met. Going through several stages, to unlock the final level of the game, you must visit the museum. Digital technology is not just a new tool to visualise, explore or consume cultural heritage – it can also assist with conservation efforts. 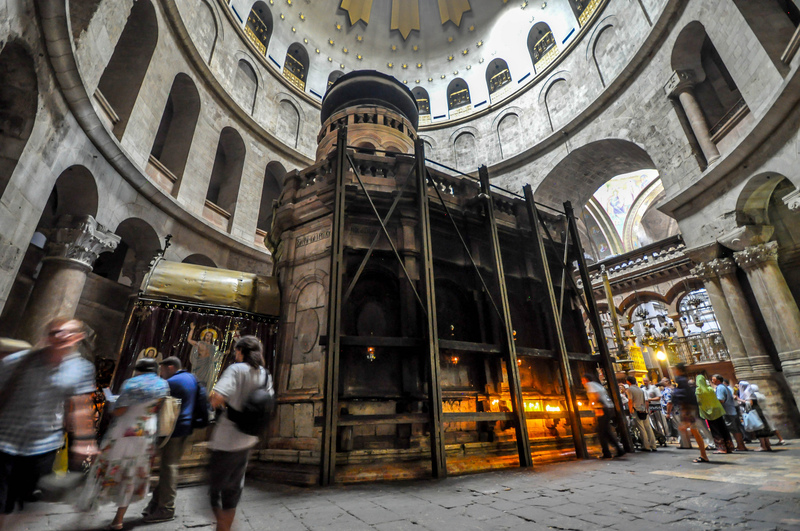 Professor Antonia Moropoulou of the National Technical University of Athens, Greece, spoke in detail about the restoration of the Holy Aedicule in the Church of the Holy Sepulchre in Jerusalem, Israel. She worked with digital specialists to develop a high-resolution 3D model of the Holy Aedicule, which allowed her team to devise the optimal way to restore it. The model allowed them to identify damage that had been done by previous conservation efforts, and to assess how the monument might react to seismic activity in the area, and plan its rehabilitation accordingly. Innovation and digitalisation are not synonymous, however. Other new initiatives in cultural heritage preservation and promotion included using neutron beams to identify biological remains within fossils, nanotechnology in gels to restore paintings, and leveraging cultural heritage as a catalyst for urban regeneration. The European Heritage Label and the European Capital of Culture were highlighted as initiatives that not only supported cultural heritage, but also brought the idea of a shared European identity to the citizen. European Heritage Labels are awarded to sites of important significance to European history, with a focus on promotion and facilitating access to cultural sites. They have a symbolic value – they have played an important role in European history and the activities that they offer bring the European Union and its citizens closer together. The initiative differs from the UNESCO World Heritage List because of the focus on the European narrative. Cities throughout the EU compete annually for the prestigious annual title of European Capital of Culture. Two cities are awarded each year, and the winners engage in a year-long cultural programme of activities. Editor's note: This article was updated on 22/3/2018 to clarify the affiliation of researcher Sofia Pescarin.